Groups of girls and boys outside their entrances to East Meon National School, 1900. William S. Tregear, headmaster, on the right. Before 1845, the young children of East Meon had been taught in the north transept of All Saints Church. 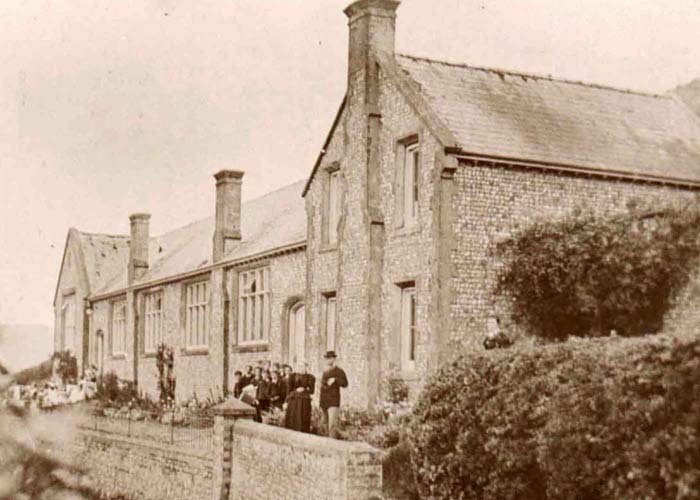 The Bishop of Winchester donated a narrow strip of land a quarter of a mile to the east of the village and East Meon National School was built, and remained until 1964, when the Church of England Primary School was built in Chapel Street. In this collection are legal documents recording the transfer of land by the Bishop, a Hampshire Record Office summary of school records which it holds, pictures of children and teachers who attended the school and records collected by the family of William S. Tregear, the second Head of the school. For a full account of the life of Mr Tregear, on the East Meon History website, click here. I have just checked the school register and I joined the school in 1963 so my memory is a couple of years off, but I can certainly say that I attended the old school for at least a year until we moved to the new school in chapel street. I used to walk home to South farm from the school and on more than one occasion I had to be rounded up because I had decided to go off somewhere to play.